We eat a lot of grain-based salads. They’re hearty and healthy. And if you have a vegan in the family as we do, they satisfy everyone. We’re cutting back on rice a bit, but there are many more grains out there begging to be made into salad. Like quinoa, for example. 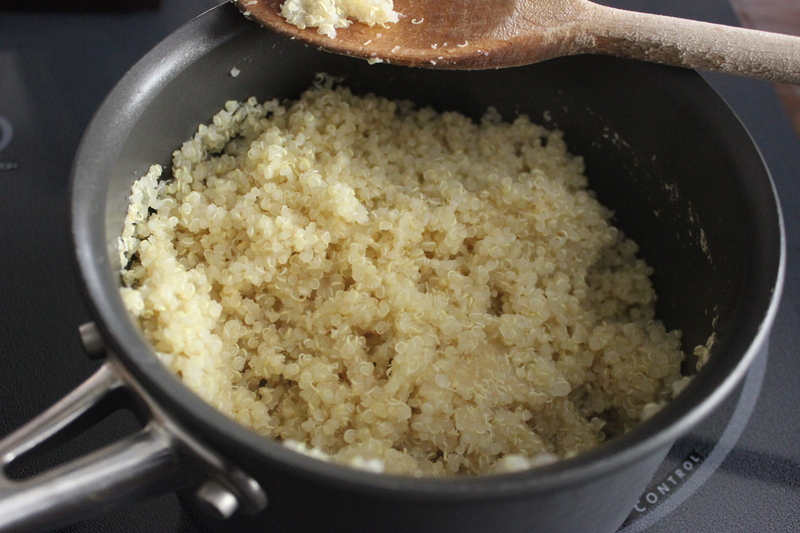 Quinoa is technically a seed not a grain–grown in South America. What makes it such a star is that it’s a complete protein, high in manganese and phosphorus. It cooks up pretty much the way rice does–quickly. Which is handy if you’re in a hurry. 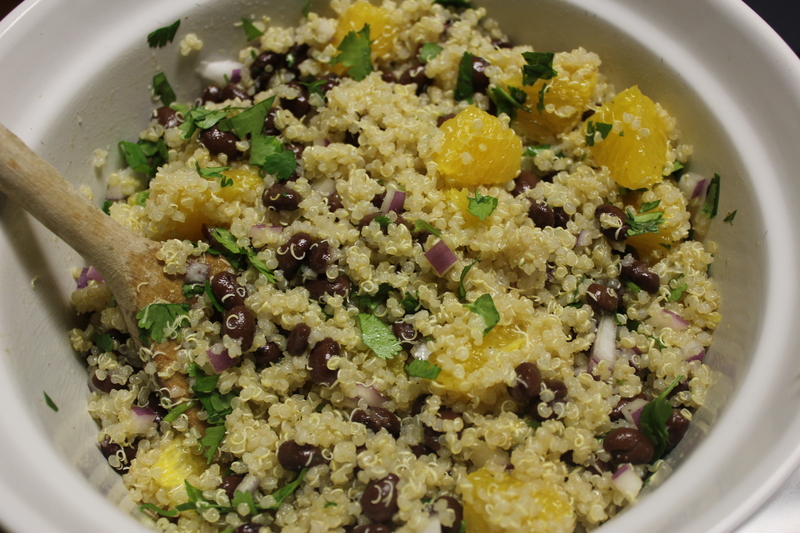 I found the recipe for this Quinoa and Black Bean Salad with Orange-Coriander Dressing at theKitchn. I tried the recipe the way it was written–separating the orange sections with a knife. They give a link to how it’s done. If that seems like too much work (and it did to me although the orange segments were delicious), substitute a few of those nice seedless clementines for the oranges and just throw the sections into the salad. That’ll be quicker and still taste great. This salad is so pretty to look at that I think it would be a great dish to bring to a party. 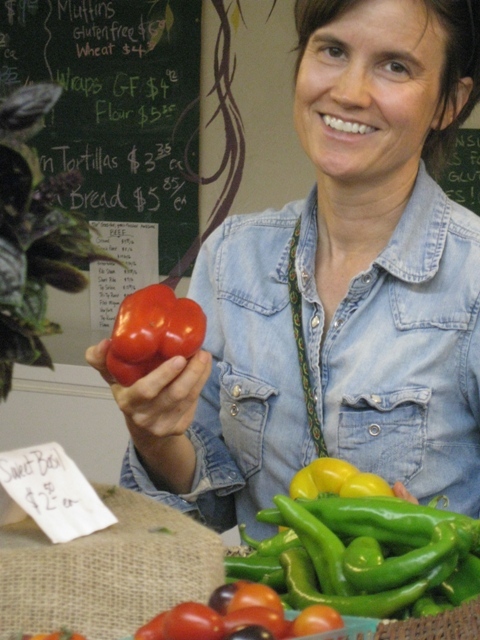 And have you ever tried farro? It’s an ancient wheat variety with a chewy risotto like texture. 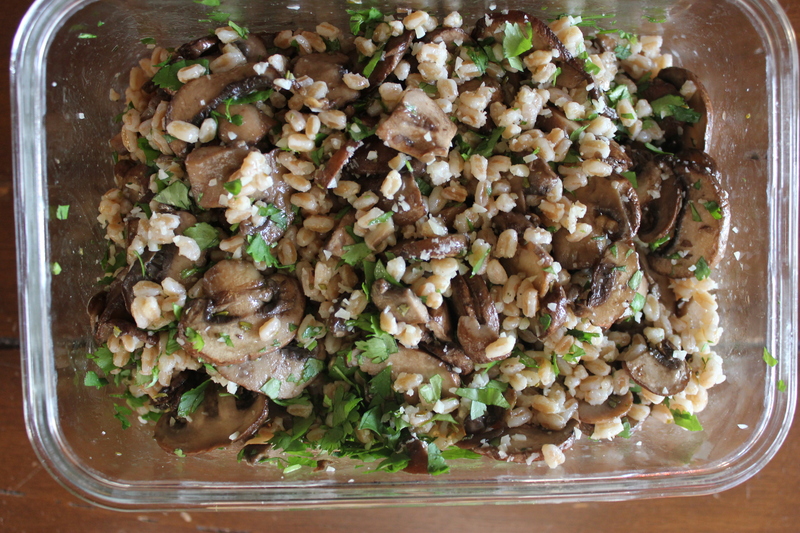 This recipe, Farro with Roasted Mushrooms, was a community pick on the hip and trendy cooking site, Food52. This recipe can be made vegan by serving the Parmesan cheese on the side. TIP: Grain dishes are about as easy to improvise as soups. I doubled the amount of mushrooms called for in the original recipe and roasted them with lots of fresh, finely chopped rosemary to good effect. Another time, when I discovered I had no mushrooms, I substituted bite size pieces of roasted cauliflower instead. Add what you like and make it your own. 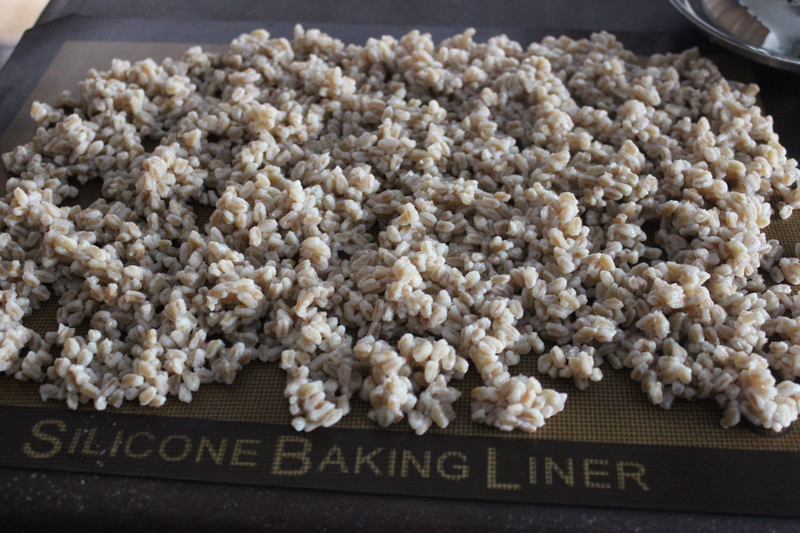 TECHNIQUE: The secret to keeping the grains in a salad from being wet and mushy is to spread them out to dry once they’re cooked. Use a large roasting pan or cookie sheet. Or a silicone baking liner like this one. Once they’re at room temperature they’re ready to use in salad. Dinner for one tonight. Hardly ever happens. 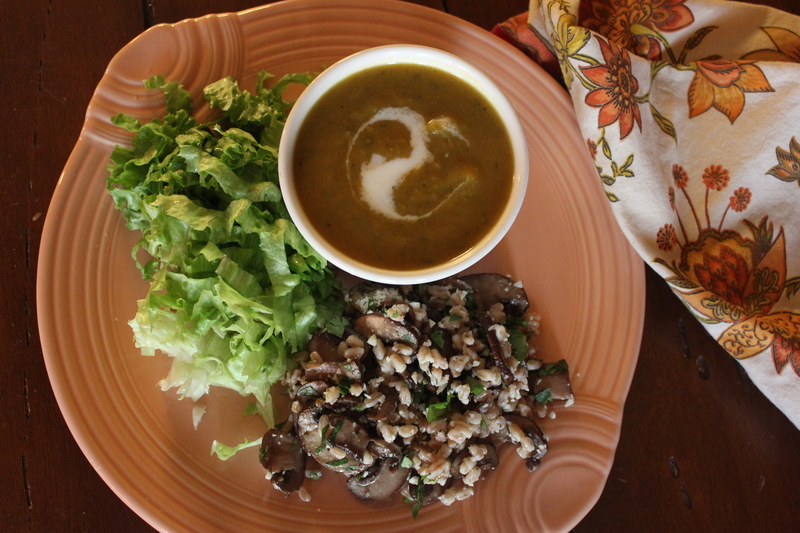 Leftover soup pairs well with my grain salad. And leftover grain salad makes for a great lunch. Look for these grains in well-stocked grocery and natural food stores. Enjoy!